I'm doing fall a little differently this year...in green and white! And I have made a wonderful discovery...that color combination looks great with one of my favorite finishes...galvanized metal! The colors are so soft that they don't detract from the metal. Instead, they seem to emphasize all of that wonderful patina! First, I have set my table with my favorite burlap table runner for a soft background with lots of nubby texture and added my new favorite find...my riveted galvanized basket. Then I made another discovery...pewter pairs perfectly with it! Those are my vintage Octette candlesticks by Gorham. At each place is a galvanized charger, a Pier 1 find, for added farmhouse charm. I've topped it with simple white plates and a sage green napkin. I love the flatware...my chunky Octette pewter. I've added fun green glassware, also a Pier 1 find from several years ago. At each plate is a small white pumpkin sitting on a faux fall leaf. I've tied a simple Kraft paper tag with jute twine to serve as a place card. I love the way the galvanized touches add an aged patina to the tablescape! ...and is filled with an assortment of pumpkins, pears and pine cones for lots of texture. I hit my favorite farm stand with green and white in mind and was happy to find some interesting gourds to add to the mix, too. This one has a curly stem that echoes the handle of my basket. Don't you love those rivets? Here's a final look. I have a confession...I love this one so much that it will stay on my table until Thanksgiving since no big dinners are planned before then. My little seven-year-old grand has even commented on how much he likes it! :-) That's quite a recommendation! And if haven't seen it, please be sure to check out my WHITE PUMPKINS AND OAK LEAVES FALL MANTEL...more green and white for fall! 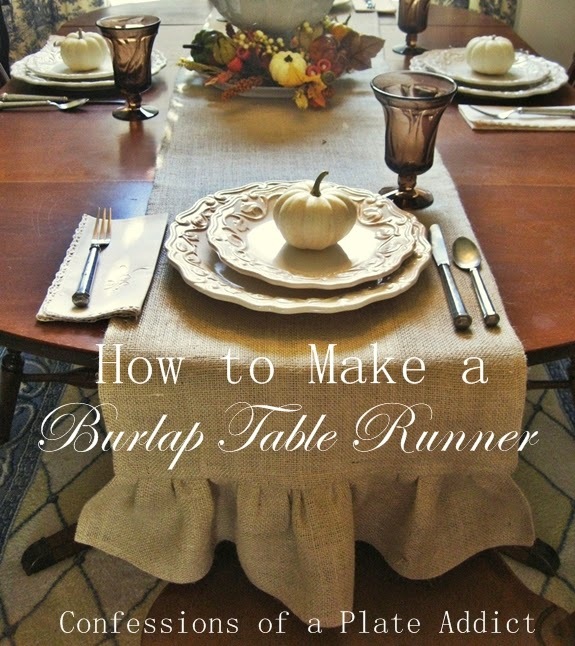 Just in case you are interested in making one for yourself, here is my RUFFLED BURLAP TABLERUNNER with very detailed instructions. It's easy and inexpensive to make and has been a real work horse for me. It stays out from fall through Christmas each year. And stay tuned! There's more fall décor to come! Such a beautiful color palette! Deb this is so pretty. I love the soft colors and all the textures! Great job as always. I love this neutral arrangement and the galvanized charges are just the right touch. I love your table I would like to know where to find the riveted galvanized basket and chargers. Wish you would decorate my house in Georgia. Beautiful table! I too would love to know where you got the galvanized basket in the center of the table. So PERFECT! It's very pretty Deb and those galvanized chargers are great. I love that this table is simple and elegant at the same time. This is THE perfect tablescape for me! It is gorgeous! I have a huge love for green & white or green & cream. I've yet to see a shade of green I didn't find beautiful. Every year, I decorate for Fall, Christmas and winter in shades or green and white with natural accents and either a touch of gold or silver. My family and friends love to joke about my holiday decor. I did attempt a burgundy/green look one Christmas; I couldn't wait to take it down! I love your choice of green combined with the rustic, natural look;SO very pretty! Is it okay if I copy your beautiful creation for my table? Thanks for the inspiration! Of all the fall tablescapes I've seen this season, this one is a favorite! You truly captured the essence of autumn (without orange!)! !